Yes, We Can Fix Your Clogged Toilet. A clogged toilet in your house can be a huge mess and an even bigger inconvenience for any home owner or renter. Often time’s people would rather just call a plumber to handle the situation, but most of the time you can save yourself both time and money by doing a few things first. There are two different types of clogs: below the toilet and within the drainage system. Simple toilet clog – these are the most common types of clogs. They’re caused by excessive toilet paper, paper towels, sanitary products and diapers. These items quickly jam up the pipes and cause a blockage. Foreign objects in the toilet – Oftentimes, children are fascinated by the flushing mechanism on toilets and try experimenting with other foreign objects such as toothbrushes, toys, toiletry lids and pretty much anything else imaginable. Augers can be used in this situation because they pull whatever is causing the clog back up, rather than forcing it through like a plunger would. Bigger Problems – Occasionally, the clog goes way beyond a basic clog. If you’re finding more frequent clogs and noticing your sinks running slower, the problem could be a clog in the mainline. Roots growing in the pipes and rust and gunk blocking the pipes are also big problems. Contact a professional for these jobs. This type of clog is the easiest to remedy; you can usually just plunge it out. Make sure you keep a reliable plunger on hand for just such situations. 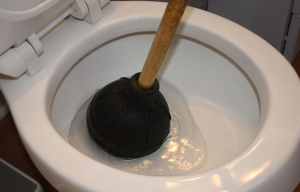 To plunge, use a well-fitting plunger to get the best suction and pump it up and down steadily. Pour a bucket of water in the bowl once the water drains to be sure that it has really drained completely. Otherwise, you might suffer a dreaded overflow situation. If plunging doesn’t work to break up the clog, the next step is to use what’s called a “closet auger” or “toilet snake.” Typically an auger will extend up to three feet down the drain and usually that’s enough to reach the clog. Insert the auger by twisting it until you reach the blockage. Use it to push and pull the clog until it until it breaks up and the drain flows. Once you break up the blockage, give the toilet another plunge and add a bucket of water to help it flush. If the above options don’t help, the clog is most likely deeper in the pipes. Also if the other drains in the house have begun to back up with sewage, it’s probable that there’s a clog in the main drainpipe. In this case, you need to call plumber to make sure the job is done correctly. Although, if you’re determined to do it yourself, there are longer augers available that you can use. The first step in finding the right plumber is making sure they are licensed and insured. This protects you and your neighbors in the event of an accident. Then, try collecting references or reading a company’s reviews. Sometimes home improvement companies refer to each other. If you have a great electrician that you trust, they asking them who they prefer to work with. This makes calling a plumber for a clogged toilet a much easier experience. This website really has all the information I needed and didn’t know who to ask.